One way that you can show your solidarity with your partner during the early months of pregnancy is to take the initiative. Far too often, partners take a backseat when it comes to planning for the arrival of a new baby. But remember, you are as much a parent of the child as your partner and, however much the old-fashioned gender roles might lead us to think otherwise, your involvement does not begin and end with providing the sperm to fertilise the egg. You might even say that since she’s providing the womb, the placenta and the amniotic fluid, it is especially incumbent on you to do more. In fact, more and more parents are choosing to share child-rearing responsibilities equally between the two partners, while in some cases men (or the non-child bearing partner) are the main carers. This is the 21st century after all and we should be glad that we live in an era where we don’t have to miss out on all the important milestones that come with pregnancy and parenting. Nowadays, partners can fully participate and, by doing so, we can show our love and support as the seismic shifts and hormonal upheavals that characterise pregnancy take holed in out loved-one’s body. Of course, we can’t actually carry the baby. But there are other things we can carry. From the intangible – for example, our partner’s fears, anxieties and mood swings – to the more practical – cooking meals, doing the laundry and taking on responsibility for more chores around the house. Furthermore, we can impress our partners by showing that we are prepared for the day the baby arrives. And guess what? There’s going to be loads of stuff you, your partner, and your new baby need when it finally arrives. Okay, we’re not suggesting you just go out and by it all now – it is after all only week 6 – we do suggest that you begin to consider how you might source the things you need and work out the areas of support that you can best offer at this early stage. So what baby requirements are on the list? There is so much. Almost too much to think about. But fortunately for you, there’s lots of help out there. 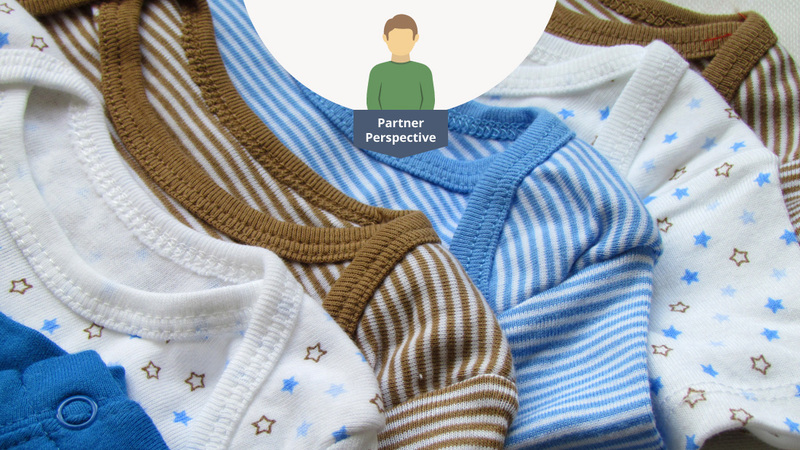 Let’s first and foremost look at baby clothes Yes, we’ve started with something your partner probably thinks she will have to take care of herself. But now you can impress her with your superior knowledge of newborn accoutrements (that’s babygros and stuff). You may even shock her with your hard yards of research. We won’t tell, we promise. You are going to need loads of baby clothes. By this we mean basics, and the same things will be needed regardless of whether you’re having a boy or a girl, so feel free to buy these things soon – perhaps research them now and make your purchases during the second trimester. 10 button-up body suits – (these are like all in one vest and pants which have poppers at the bottom) it sounds like a lot but newborns have a tendency to wee, poo and be sick over everything. You might even get through as many as five a day. Long sleeved and/or short sleeved, depending on the time of year. 10 all-in-one sleep suits – again, it sounds like a lot, but once you see the pile of washing you’ll be glad you have so many. Poppers are great; zippers have a tendency to pinch skin. 6 pairs of trousers or leggings – these are great for daywear and should be loose-fitting enough and soft enough to be comfortable when put over nappy and bodysuit. 2 hats – the type of hat you choose (i.e. warm hat or sun hat) will depend on the time of year. We say 2 because you’ll almost certainly lose one fairly quickly. 10 pairs of socks – essential to keep your baby’s toes warm, but teeny tiny socks have a well-known tendency to mysteriously vanish. 2 blanket sleepers – these are a safer alternative to blankets, but be sure to steer clear of any that contain drawstrings, which are a known strangulation hazard. 4 pairs of scratch mittens – these are to help keep your baby’s face free of self-inflicted scratches and can reduce the chances of nasty dermatological infections. We say 4 pairs because, like socks, they tend to disappear. They also get regularly vomited on. 5 cardigans or jumpers – you might not need so many if it is summer, but remember, garments regularly get covered in breast milk, snot and vomit, so unless you’ve got a laundry maid (that could well be you) having plenty of spares to hand is essential. 1 snowsuit – although not necessary in the summer, a good warm snowsuit can help you feel confident about taking baby out during colder winter, spring or autumn months. Now for some general rules when it comes to newborn clothing. Above all, make sure that the fabrics you choose are soft and breathable – cottons, fleece and soft wools are all a good idea. Watch out for anything that has stiff or abrasive parts and, wherever possible, you might wish to go for organic cotton as well as garments that you know have not been treated with strong chemicals. Always remember to wash newborn garments before use as some manufacturers treat them with chemicals which can have an irritant effect. You may have only just found out that she’s pregnant, but by taking practical steps to be ready as soon as possible, and to show that you are joining her in wanting to be prepared, you can help the reality settle in meaningfully while also taking important practical steps that will save you the prospect of panic buying in the future. For tips on panic buying – see week 38 of the My BabyManual website!! !